In 1875 the young Eakins searched for a theme that would represent him well at the nation's Centennial exhibition in his native Philadelphia. The subject he chose was an ambitious one, far from the safe, traditional history tableau a less adventuresome artist would have submitted for such an important occasion. Painted on a monumental scale, the finished composition shows an operation and medical demonstration performed by the world-famous surgeon Samuel David Gross at Philadelphia's Jefferson Medical College. The Gross Clinic (acquired by the college in 1878 and still displayed there) relates directly to Eakins's own experience as an art student who had witnessed many medical procedures in an effort to understand the intricacies of human anatomy. Following his typical working method, Eakins painted several preparatory studies for his masterpiece, in which the surgeon, holding a blood-covered scalpel, stands over the patient in the center of an amphitheater full of spectators. 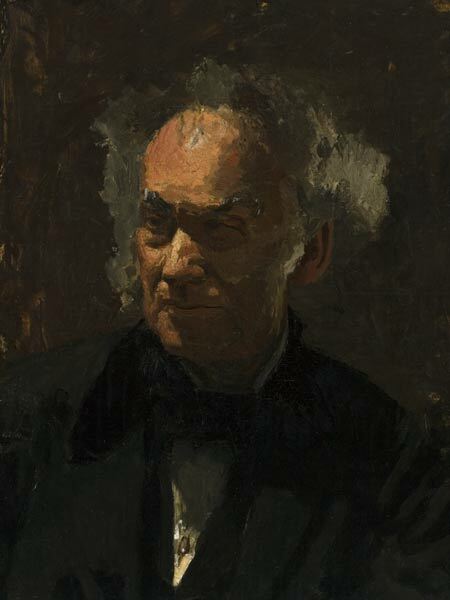 For Worcester's sketch Eakins used a palette knife to capture the essential volumes of the head; the dramatic splash of light on the forehead conveys the genius he saw in the heroic image of Dr. Gross.